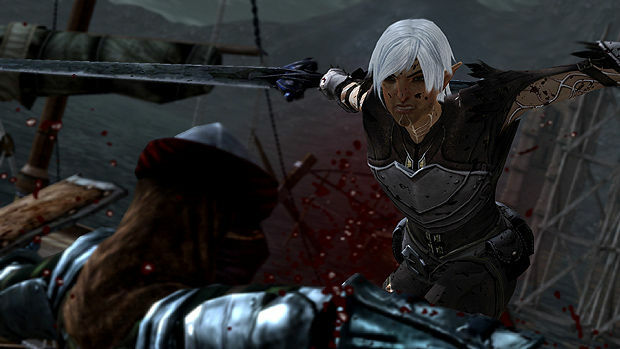 Unlike games like Fable and BioWare's own Mass Effect, Dragon Age: Origins deftly sidestepped framing its character interaction systems as a set of moral binaries. It's a subtle shift: actions aren't judged in absolutes, but situated in the larger social structures of the game. In-game characters -- complete with their own backstories and affections -- keep tabs on you, but only as a measure of your relationship together. It's a more nuanced system: being kind to a Chantry priest, for example, might net you points with Leliana, a former nun; but Morrigan, hunted and persecuted by the church, finds it alienating. That web of competing loyalties is only amplified when it comes to Origins' major plot decisions -- good luck trying to keep Wynne from trying to kill you over Andraste's ashes, or Alistair from leaving your party in disgust when he finally confronts Loghain. The problems, such as they were, lie mostly with the players. Depending on how seriously took their role-playing, these mechanics might give them a chance to really dig into each character's history, urging them to open up and divulge their secrets. 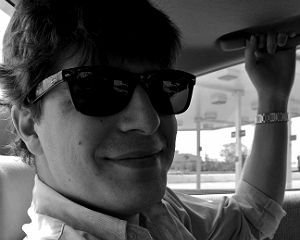 Knowing more about a particular companion makes it easier to navigate sticky social conundrums, thereby earning you more affection, and thus unlocking even more conversations and abilities. If you play the Warden as a caring leader, Dragon Age: Origins happily locks you into a positive feedback loop. But when viewed mechanically, games like Origins also espouse a type of cynical exploitation that's hard to shake. Positive character interaction is incentivized with extra skills and abilities, and Origins' comes dangerously close to suggesting that kindness is a way to manipulate people. Even more detrimental, perhaps, was Origins' gifting mechanic -- even the gravest offenses to your friends could be patched up with a bottle of booze or a nice necklace. Again, the shortfalls of Origins character interaction system are largely contingent on the player, but the potential for those choices to get whitewashed -- because Origins is at its best when the Warden is consistently gaining approval, character interactions never seem significant. When the the stakes aren't high enough to make failure meaningful, it's a little too easy to sleepwalk through the Warden's budding relationships with his companions. And that's part of what worries me about Dragon Age II's new friendship-rivalry mechanic. "What we're trying to do is torpedo the concept of 'negative,'" says Mike Laidlaw, the lead designer for the game, in a recent interview. Instead, "you either gain friendship or you gain rivalry." Friendship is a pretty straightforward concept, but rivalry is accrued by disagreeing with or antagonizing your companions. "If you're consistently saying, 'No, I disagree with the things that drive you,' you become their rival and they gain boosts, and content opens up as a direct result of that," Laidlaw explains. 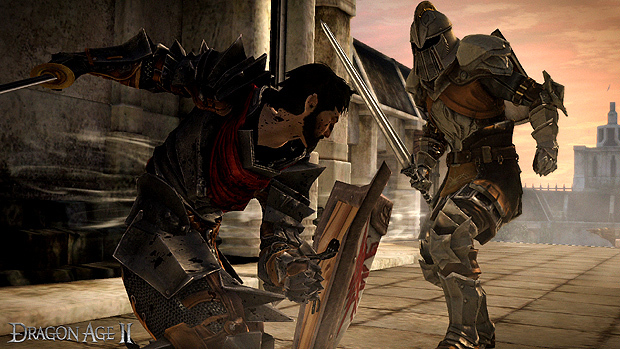 As in Origins, companions that are friendly toward Hawke, the sequel's protagonist, are rewarded with boosted stats and unique abilities. In Dragon Age II, though, rivals are similarly rewarded with their own place in the skill tree. "The two are actually both valid: they open up content, you can have romances with your rival and they do provide those different abilities," Laidlaw asserts. The friendship-rivalry dichotomy, with both ends equally incentivized, was designed to keep players from disengaging with the narrative in favor of manipulating their stats through approval bonuses. "It doesn't encourage you to act nicey-nicey if you don't want to," notes Laidlaw. "There's a valid path either way. "And I like that a lot -- it's honesty [in role-playing]. And it is being able to have a consistent relationship instead of saying, 'Well, they're going to leave me [if I disagree with them], but I like them as my healer,'" he continues. "And I think it makes Dragon Age II a stronger experience over all." I am worried, though, that the friendship-rivalry mechanic strips some of the tension out of Dragon Age II's character relationships. On the one hand, players are given the chance to role-play freely -- without the temptation of character boosts sitting at the "nice" end of the spectrum, players can react as they see fit, without fear of locking themselves out of new abilities and features. And the value of that freedom shouldn't be understated. On the other, BioWare has provided players a safety net -- they'll be rewarded with extra abilities no matter how they treat their companions. I only got to spend a short time with an early build of Dragon Age II so my fears are speculative. But I'm disappointed by what the rivalry mechanic might imply: that Hawke can treat her companions however she wants, that she could force them into compromising moral situations without their being able to lash out. It's not that Hawke cannot or should not be spiteful, aggressive, or amoral, but there should be repercussions for her behavior. One of the pleasures of the genre is being able to weigh choices; but I'm worried that in the Free Marches, all choices about Hawke's relationship with her friends weigh the same.